Dr. Sheena Howard poses with the cover art from her book, "Superb"
A comic titan, professor, and mother to a newborn, Dr. Sheena Howard is defying her wildest dreams. Howard, the 2014 recipient of the Eisner Award, said she initially approached comics as an academic because of the role it could play in the political space. “It was such a journey to study comics from an academic perspective and have people not believe in me...that when I won the award it took me by such shock to be recognized,” Howard told NBC News. She has examined comics such as “The Boondocks” as a Ph.D. student at Howard University and said it’s essential to bring that sort of commentary to her creative endeavors. 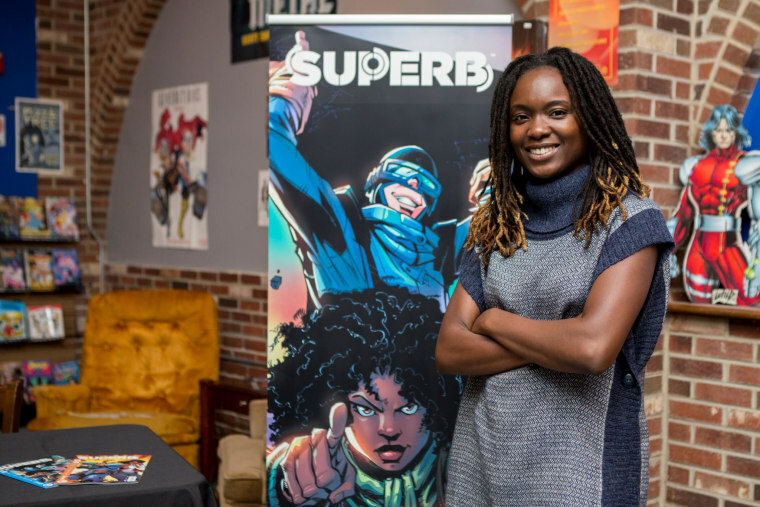 Incorporating a theme of fake news into her latest story line in 'Superb', a comic series co-written by 'Luke Cage' comic writer David F. Walker, the Philadelphia native finds it important to add current political challenges in order to bring ethos and depth to her comic creations. But while her work is often political in nature, she is careful not to inundate adolescent readers with overt commentary. “First and foremost, we want it to be entertaining and we want people to see themselves in the characters,” she said. Howard also uses her platform to elevate other women of color in her field. In her book, “Encyclopedia of Black Comics,” Howard showcases black illustrators, artists, writers, editors, creators, academics, and historians who have made significant contributions to the comics industry in the United States. The launch of her book was made even more momentous at Philadelphia’s Almagam Comics and Coffeehouse, the first comic book store in the country owned and operated by a black woman. But how long will this fascination last? Comics have not been Howard’s only means of exploring race and politics. In 2016, she wrote, produced, and directed a film about how the educational system shapes notions of race. “Remixing Colorblind” tackles topics from affirmative action to HBCUs to the application process, and it’s part of what Howard sees is her role in the discourse. “All I want to do is fight for social justice and inspire other people who might be able to relate to me in different ways,” she said.